This dish offers an opportunity to incorporate one of the plant kingdom's nutrient giants as well as a unique protein alternative. Cabbage houses one of the highest levels of disease fighting micronutrients. Specifically, a family of phytochemicals called glucosinolates can be found in high concentrations. These molecules are converted into bioactive derivatives called isothiocynates which have chemo-protective and chemotherapeutic activity. These phytochemicals have the ability to identify mutations and induce cell death in tumor cells. Intervening at the genetic level with such precision allows for the preservation of healthy cells while targeting and destroying only cancer cells. Even current chemotherapy drugs can not differentiate between diseased and healthy cells with such accuracy. Using red cabbage in this recipe not only adds an appealing color, it also deliverers a dose of anthocyanins that work both as an antioxidant and at the cellular level to suppress inflammation. To increase protein in this dish tempeh, a fermented soy product, can be used. This meat alternative is economical and possess all the nutritional benefits found in unprocessed soy products. If you can not find tempeh substituting ground turkey or lean beef is acceptable. This hearty and filling dish truly is a meal brimming with nature's medicine. It is important to steam the cabbage as the enzyme responsible for the conversion of glucosinolates to the bioactive form of isothiocynates is destroyed at a higher rate with other cooking methods. Directions: In the medium sauce pan prepare the whole grain according to the packages instructions. Fill the large pot with one inch of water and place the steamer inside. Heat the pot on medium to low heat. Remove as many leaves from the cabbage as possible and set them on top of the steamer. Cover the pot with a lid and allow to steam for 30-40 minutes or until the leaves are tender. In the mean time heat the oil in the sauté pan on medium. Chop and add the onion and garlic. Season with the salt and pepper and cook until tender. Add the tempeh and break apart as you would with ground meat while sautéing. Add the seasoning blend and stir to combined. When evenly seasoned add the tomatoes and stir to combined. Once the cabbage is finished cooking preheat the oven to 350 degrees. Remove the cabbage and rinse the leaves using a strainer. 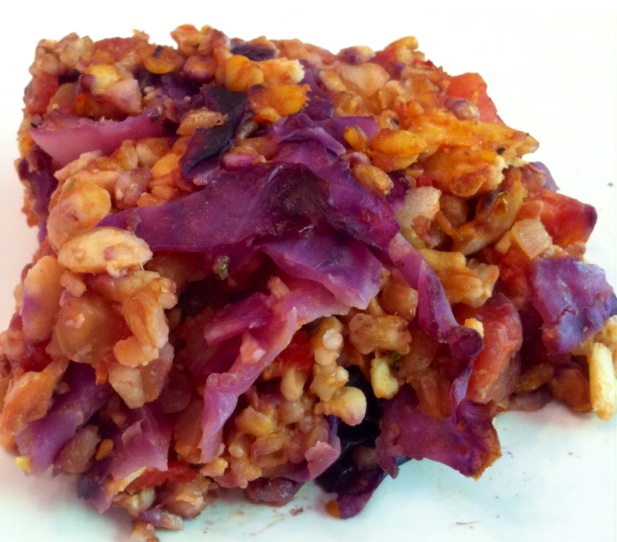 Chop the cabbage into ribbon like pieces and add to the tomato and tempeh mixture. When the whole grain is finished cooking add it to the sauté pan as well and stir to combined. Turn off the heat and add the vegetable mixture to the casserole dish. Top with the cheese and place in the oven for 30 minutes.